The Chava Weissler papers are now available for research! Prayer is how the devout connect to the divine. It helps shape the life cycle and daily schedule of all religious communities. But, prayer is not always an equal experience for those who wish to participate. Judaism is a religion that has a reputation of being male centric and Hebrew centric. These tendencies extend to prayer and the daily or life cycle events to which they are tied. For generations, Jewish women were excluded by both the content and language of Jewish prayer, which can often be focused on men and are typically written in Hebrew, which not all women were taught to speak or understand. However, in the sixteenth and seventeenth centuries, new prayers known as tkhines began to appear. These private devotions were usually written in Yiddish, by both men and women, and were intended to be used by women and men who did not have extensive knowledge of Hebrew. These new prayers opened up Jewish ritual practice for women in an entirely new way, allowing them to build new connections to the divine and to be fuller participants in key Jewish rites. However, these tkhines also helped create a religious dialogue and set of practices for areas that traditionally fall within the “women’s domain” and are not addressed in typical Jewish prayer. Women suddenly had a means by which to verbally express their supplications to God regarding pregnancy, childbirth, infertility, and widowhood, to name a few. Enter Dr. Chava Weissler, professor of religion. In 1985, Dr. Wiessler was a member of the Princeton University faculty and had just returned from a trip to the Jewish National and University Library, bringing back with her pounds of photocopies of the over 900 tkhines she found in their collection. Already an enthusiastic scholar of Jewish women’s lives, Dr. Weissler was enthralled with her find, which would become the basis of her first book, Voices of the Matriarchs: Listening to the Prayers of Early Modern Jewish Women. Weissler’s research was some of the first to address tkhines and Jewish women’s prayers. Much like the tkhines themselves, her writing opened up a whole new world of understanding, forever changing that way that both Jewish women’s payers and women’s roles within the Jewish community are perceived. Her work was at the cutting edge of the field, and continues to influence new generations of scholars. 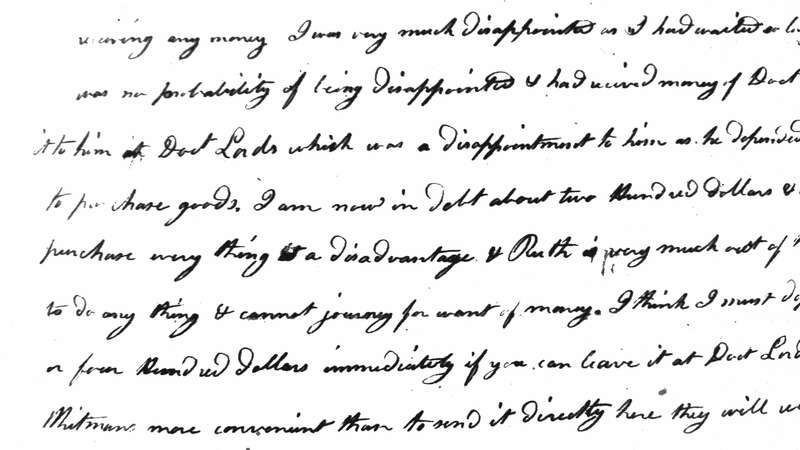 The last thing I anticipated when processing a collection of 19th century business letters (the Austin and Austin business letters) from a paper mill, was to discover a character like Ruth Benjamin (1770-1857). She first caught my attention, because the vast majority of those who were writing to the company Austin & Austin were men putting in requests for paper orders and discussing money. Amongst this sea of men, both Ruth’s gender and the tone she used in her letters stood out. At first, it was unclear to me what her relationship with the owner of the paper mill, Abner Austin (1771-1848), was. In her letters to Mr. Austin in 1817, at which point she would have been 47, only a year older than he, she takes the tone of a stern mother. She berates him in each letter, voicing her “disappointment” in him over and over in each letter for not sending her money, or sending her less money than she had wished for. Though the topic of these is the same as many of the other letters in this collection, her tone is far from professional. 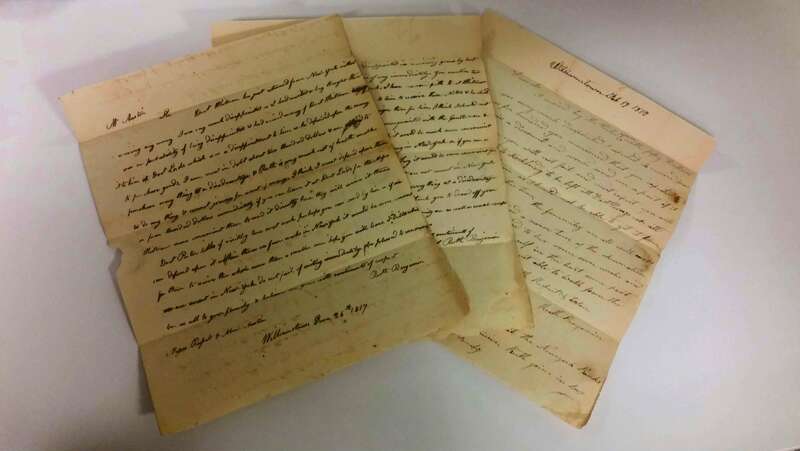 At first, I thought that she might be family member, looking for Abner to help her with her financial woes, as various family members of his had done in other letters. However, in one instance, she signs a letter to him “your friend” which, though uncharacteristically friendly in tone for Mrs. Benjamin, suggested that she was not in fact a family member. After a bit of poking around, I discovered that Abner Austin and his brother had originally procured their paper mill and the land it stood on from a Mr. Nathan Benjamin in 1813. According to death records, Mr. Benjamin had passed away that same spring. As the Benjamins had only one daughter, Lucy (1791-1892), and no one else to take over the family business, it seems likely that either Mr. Benjamin’s death, or some circumstance that may have led to his demise, instigated the sale of the mill and property. However, this does not explain why the widow Benjamin continued to remain in contact with Abner Austin, or why she continued to ask him for money. Unfortunately, the handful of letters contained in this collection provide no real answers to this mystery. Whatever the ongoing nature of the relationship between Ruth Benjamin and Abner Austin was after the purchase of the paper, one thing is clear, she was a firebrand who had no compunctions about demanding what she felt was due to her.